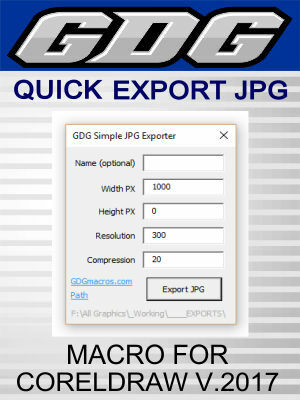 A very simple macro for CorelDraw v.2017 to export JPG images quickly. I use by assigning to hotkey Ctrl-J and often export my JPG files to the same folder. Open source so you can modify this very basic macro. Does not include an icon. Might work fine in lower versions also. For CorelDraw v.2017 only.